because that’s what it’s all about – our common humanity. Thanks to our new community of YMM Elves, 2018 will likely be our best Marathon ever! YMM elves spend countless hours counting You Matter cards, putting those cards into envelopes, and placing stamps and addresses on those envelopes. 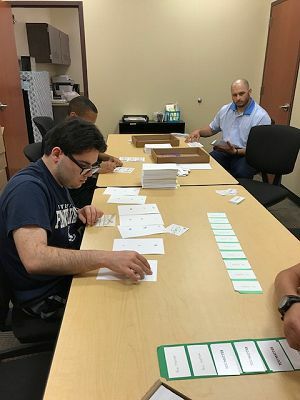 This year we’re privileged to have the extraordinary students and staff of the Special Education Department of Upper Dublin School District packaging our You Matter cards. How this partnership came about is another example of the You Mattermagic. Last year I told you how I met Laura(now our Fall YMM Production manager) when she approached me in the parking lot of a drug store to comment on my ‘U Matter’ license plate. It was Laura who introduced me to our new and amazing You Matter printing partners, Kim and Anthony of Minute Man Press-Ambler. 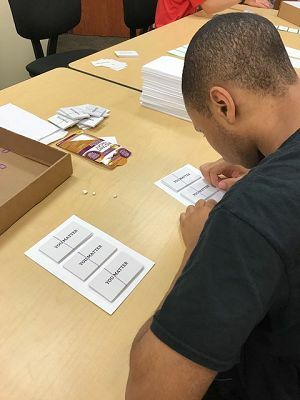 Once Kim and Anthony understood the labor involved in putting the card packets together, Kim said, “Well I guess you’re going to need some stuffers,” and she suggested I contact Nekicia Black, the Transition Coordinator at Upper Dublin School District. Nekicia introduced me to the wonderful crew of teachers, staff (most notably Lori Saville, Peter Baker, and Bindi Desai from the Upper Dublin School District’s Special Education Department.) The students participate in ESY (Extended School Year) where they continue to work on employability skills through campus based instruction. Once they understood what we’re up to, they were eager to be a part of it. We are deeply grateful to all the teachers, staff, and students for their enthusiastic participation.